September 27th -- Celebrating Creative Thursday! This is my entry for the first annual "Creative Thursday" event, hosted by (of course) Marisa Haedike of Creative Thursday. It's called The Romantic, and it's actually a study for a larger piece. I had to rush on this one because I wanted to paint it today, and I only had about 3 hours of babysitter time! :( It was SO hard rushing because I usually agonize over color choices and judge so much by my instincts. With this one, I couldn't take as much time as I would have wanted to make mistakes and fix them! But I like the final product (so far). Prints will soon be available on ETSY. And hey, it's not too late to post something creative to Marisa. She's sharing all of the Creative Thursday submissions! 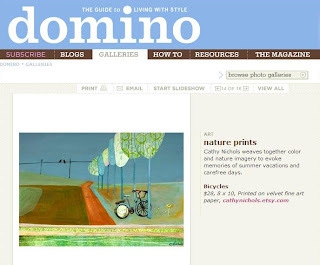 Wow -- I'm in Domino Magazine Online! 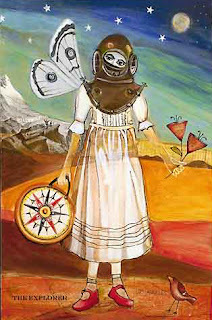 "The Explorer" now in Women Artists Datebook 2008! 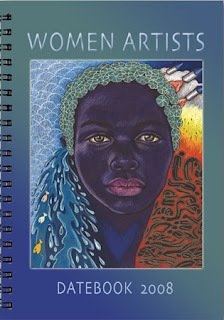 Today I received my much-anticipated complimentary copies of the Syracuse Cultural Workers' 2008 Women Artists Datebook, and they are just beautiful! 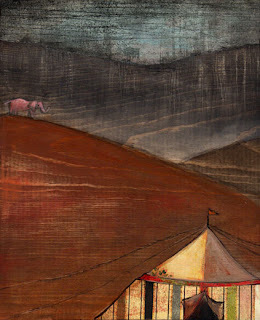 My painting, "The Explorer" illustrates the month of December. Even if I wasn't in the datebook, though, I would buy one. 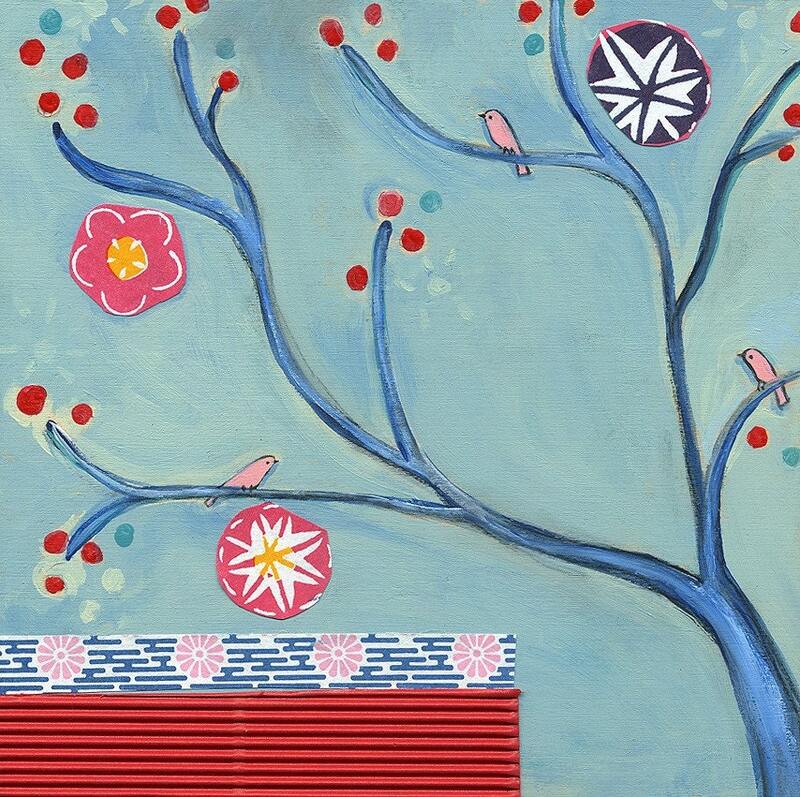 Each month includes gorgeous full-color, glossy artwork and poetry by women artists. And the calendar includes lunar cycles, 13 native moons and holidays for many faiths. It's very inspirational. 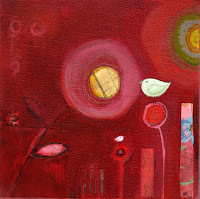 This is a new 8x10 inch mixed media piece on wood. 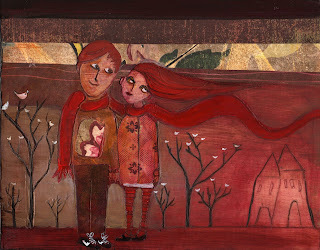 I created it originally as a study for a larger painting on canvas, but now I'm not sure that I want to make it bigger. It's sweet and small. If I go bigger, I'm considering doing a blue tone. Still thinking.... and loving this gloriously fall-like evening! This is a new painting I finished a few days ago. It's funny, but sometimes life tends to follow the paintings rather than the other way around. When I created this image, I was thinking that the little girl had discovered the beauty of flowers for the first time and was in awe of their many colors. Then, yesterday, I took my daughter to Central Park, and she was beside herself with joy as she crawled around on the lush green grass. 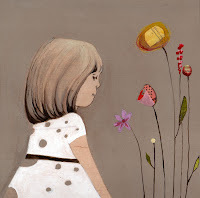 This weekend marks the opening of the much awaited Enormous Tiny Art Show at Nahcotta Gallery in New Hampshire! I will be exhibiting 6 original paintings. Sadly, I won't be at the show, but I did get the opportunity to meet the lovely Rebecca from Nahcotta while visiting LA. She came to the Ten Women Gallery to say hello and wrote up this sweet post for the Nahcotta blog. Since I live in NYC now, I'm just thrilled that she took a picture of me actually working a shift at Ten Women! I wish she and her boyfriend lots of luck in beautiful Southern California! PS - Marisa from Creative Thursday is having her first ever group sale of never before offered original paintings tomorrow (Thursday, 9/13) . I think you need to add your name to her daily paintings subscriber list to get the time that they go up for sale. Check it out! This one is called "Urban Bloom." Yes, I am finally back to painting again, and you can tell by the big smile that I'm just thrilled -- even in that scary hairstyle and ripped t-shirt (it was so hot today in NYC that I took scissors to the sleeves today before putting it on). I have finally started painting again, and I completed this piece, titled "Finding My True Home" today. The entire thing just came to mind in a few moments, and I think this is because I had been having many discussions about "home" over the summer. I do miss California, and France was lovely, but I suppose my true feeling is that home is really the place where you are loved. Even though my loved ones are spread around the country (and even the world). It's nice to think that they are always in my heart as well. With this in mind, there's a surpise in his painting hidden behind a door that actually opens. You can open the door and see the original painting at my Woodstock show this winter at the East Village Collective gallery. 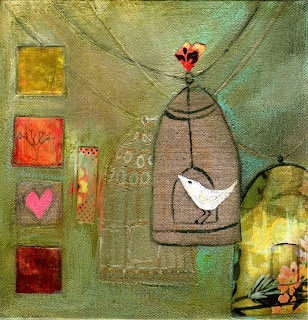 Fine art prints of Finding My True Home are available at my ETSY store. Well... I had planned to paint today, but our babysitter got sick. So, instead, I took Annabelle to Moon Soup for some "Baby Rock & Guitar." We were both thrilled with the live guitar music, tie-died t-shirts and singing. I felt like I was back in southern California. This little establishment is a fine oasis of laid-backism in midtown Manhattan. 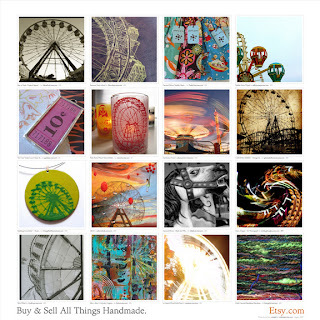 And here is the other poster -- a ferris wheel theme - featuring my "Aloft" painting (3rd row, 2nd from the left). 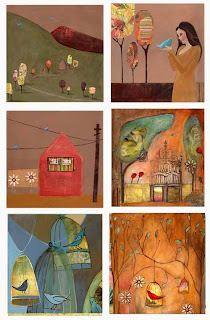 Thank you, esdesigns, for including me in this great collection. It takes me back to childhood. Now tomorrow, I must get back to work!! Hello! I'm finally back from my extended summer of travel. Before leaving for France, I had grand ideas of sitting down every night with a little creme brulee or an eclair and blogging about my fun times abroad. But, um, we didn't have internet access!! Well, that's not entirely true. We had intermittent access for about 5 minutes at a time that could ONLY be managed while positioning the computer on the far corner of the kitchen table and typing with one leg perched on a chair facing south. Eating the eclairs was a lot easier. Luckily, though, I did manage to do a few paintings. These were scooped up by my boyfriend for our apartment, so none of them made it back to the U.S. :( I decided to do a fun experiment with abstract work. This is one of my creations. It's called "Creative Thursday" in honor of my friend Marisa of Creative Thursday because I did it in a few hours on a sunny Thursday afternoon. 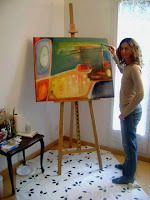 And here I am applying the final touches in my little studio. I'm standing on a piece of waterproof fabric that is usually used for tablecloths. It worked perfectly! France was just amazing, but I'm excited to start working again (now that we again have a babysitter for a few hours a day). 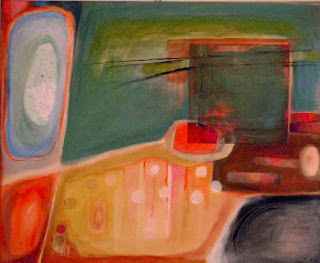 I promise to keep in touch and to post my new paintings as they emerge. Hope you all had a wonderful summer!